What Role Does The National Guard Play In Natural Disasters? Florida Gov. Rick Scott activated the entire state's National Guard in preparation for Hurricane Irma. The National Guard is one of the biggest sources of support during a natural disaster such as Hurricane Irma. Each state; Washington, D.C.; and three U.S. territories have their own National Guard unit with both federal and state responsibilities. Federally, members can be activated during wartime and national emergencies. On a local level, governors can mobilize their National Guard personnel in response to man-made or natural disasters. Florida Gov. Rick Scott activated the entire state's National Guard — 7,000 troops — in preparation for Irma. National Guard units from other states are also providing assistance. Ten thousand additional troops have already been deployed to Florida, and another 20,000 are standing by. Guard members helped residents evacuate, set up emergency shelters, provided medical assistance, and delivered supplies like food and water. 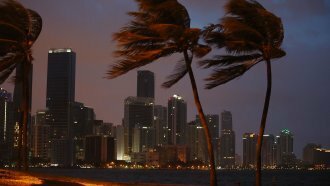 Monday morning, Irma was downgraded to a tropical storm after slamming Florida with flooding, damaging winds and storm surges. Millions woke up Monday without power.